During the Vietnam War, the U.S army was forced to go to combat in the harshest of environments. The Southeast Asian jungle was where the battle between the U.S. military and the Viet Cong took place and the conditions there were nothing like the U.S army had ever encountered. There reached a point where the army had to go for long periods of time in the jungle and thus their needs increased. The backpacks they carried got heavier each time they went for battle and this is why ALICE (All-purpose Lightweight Individual Carrying Equipment) was developed. 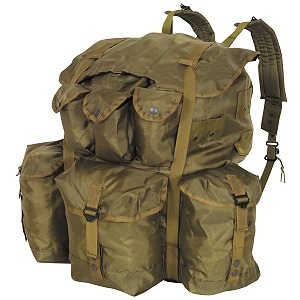 ALICE was introduced to the military on January 17, 1973 and remained the standard issue for the next 17 years. The need for lighter backpacks had been discussed in the past but the war in Vietnam made it all clear. ALICE came with many improvements and was much more convenient to the military men. Firearms were easily accessible and despite its size, the bag remained light and relatively comfortable to move around with.